Seafood Paella is the most popular of the Paellas. Its large quantity of mollusks and crustaceans make it very tasty and full of color. Although it is called seafood, you can also add fish or any other sea product. In the high-class Seafood Paellas, it is usually seen lobster, as well as crayfish, prawns or crabs. 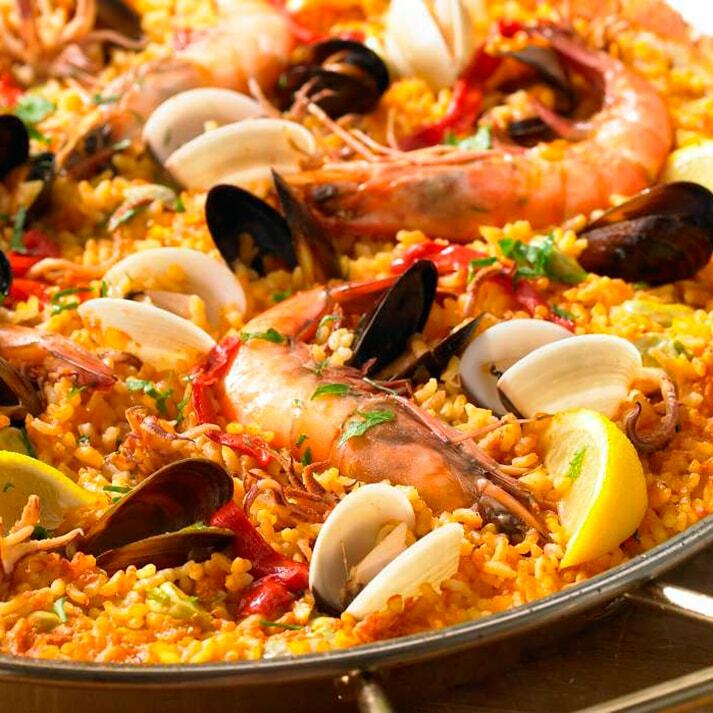 The Valencian paella and the seafood paella are always competing for the first place of the most popular Spanish paella. Other Paella recipes to check! To make this Seafood Paella we start by making the sofrito. To do this, fry the finely chopped onion in the hot oil. Remove the onion with a wooden spoon frequently, so that it does not burn. Stir fry until the onion starts to brown. Then add the finely chopped garlic and, before it starts to take color, add the chopped tomatoes. Time to add the sugar (to neutralize the acidity of the tomato), salt to taste, paprika and a few strands of saffron. Stir all the ingredients and let them fry until the tomatoes are reduced and begin to sizzle. Now that the sofrito is done, cut the squid into rings and leave the legs whole. Add the squid and let it cook for a few minutes. Then add the paella rice and distribute throughout the paella pan so that the grains adhere to the ingredients. In the meantime, heat the broth together with the wine in a separate saucepan, and when it is hot, pour it into the paella pan. After this, increase the temperature and add more salt. Stir everything again so that the paella rice is well covered by the broth, and when it comes to the boil, lower the temperature and let everything simmer for 18 to 20 minutes. It is important to stir the paella during the cooking process so that the paella rice cooks evenly. After 10 minutes of cooking, add the prawns on top until they turn pink, then turn them over so that they cook on the other side. Pour a little more broth towards the end of cooking if the paella is too dry. After 20 minutes, taste the paella rice and if it is well done turn off the heat and cover the paella pan with a cloth or aluminum foil to rest. While the paella is resting, steam the mussels with about one inch of water in a pan with the lid on, and when they open, place them on top of the paella (discard those that do not open). Serve the paella after 5 minutes of rest. And that´s how easy it is to make an authentic Spanish Seafood Paella! 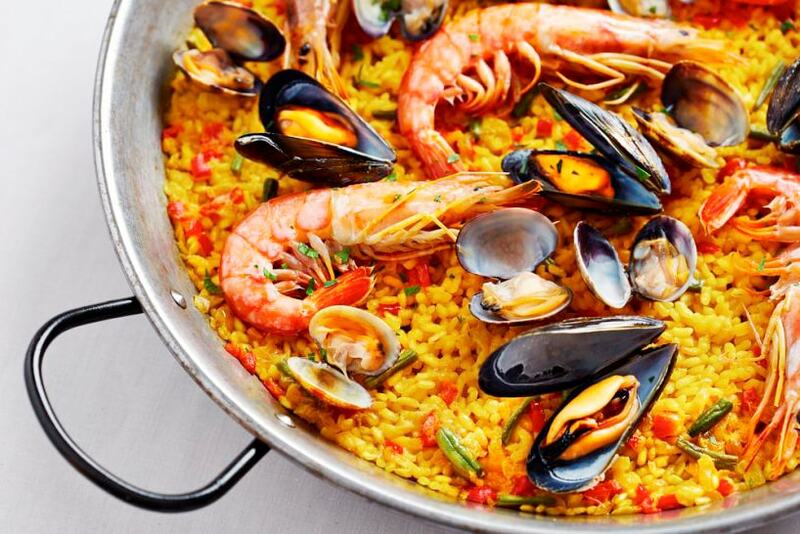 We hope you like this recipe and definitely check out more paella recipes here!